A rare opportunity to purchase a Turkish title villa in a very popular area just a few steps from Glapsides beach. The luxury villa comprises of a spacious open plan lounge and dining area and a seperate fully fitted kitchen, breakfast room. Upstairs there are three large double bedrooms with fitted wardrobes, the master bedroom has an en-suite and the family bathroom has a corner Jacuzzi bath. A feature of the property is the circular bay window with a balcony above. Standing on a large plot the grounds have been designed for ease of maintenance and are planted with a large selection of flowering shrubs and trees. There is a private driveway with parking for several cars and the footings are in place to build a garage. The private overflow pool has an attractive Roman end with stairs leading into the pool and a paved sun terrace. There is an outside shower and a barbecue area. The window are double glazed with roller shutters fitted to all windows and patio doors. This property is in sought after location a five minute drive into the centre of Famagusta and within walking distance to a wide selction of shops and resturants, the deeds are pre 1974 and issued in the owners name so no VAT to pay. A large very attractive room with a feature circular bay window and patio doors that open onto the front terrace. With patio doors that open onto the front and side of the property and an air conditioning unit fitted. A door opens into the kitchen. Fully fitted kitchen units including white goods, there are windows to two aspects a door to the hallway and a door to the garden, terrace and pool. Fitted with a toilet, washbasin and illuminated mirror. The sweeping stair case is fitted with ceramic tiles and wooden bannisters leading up to the landing that has doors to the bedrooms, bathroom and the roof terrace. With fitted wardrobes and air conditioning. There is a window that looks to the side of the villa and doors leading to the large roof terrace. A good sized en-suite fitted with a shower, toilet and wash basin. Another double bedroom with fitted wardrobes and air conditioning, with window to the side of the property and doors leading to the roof terrace. A further double bedroom with fitted wardrobes and air conditioning and double aspect windows. A large bathroom with a corner Jacuzzi bath tub, wash basin and WC and Plumbing for a washing machine and tumble dryer. The gardens are well stocked and easy to maintain. A paved sun terrace is around the sides and the pool and there is a barbecue area and an outside shower. The property is surrounded by a wall with attractive wrought iron fencing on top. Steps lead up to the front door and the front terrace wraps arounds the semicircular bay window and is paved with marble. Footings have been laid for a garage at the end of the long paved drive which could provide off road parking for 3 to 4 cars. 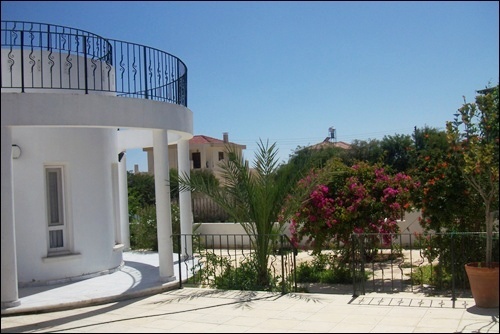 The real selling point of this property is the location; it is so close to the beach and within walking distance to Famagusta and so would be ideal as either a holiday home or for permanent living. Famagusta (Locally Gazimagusa) The vibrant town and seaport of Famagusta is a major commercial centre that hums with life and has an exciting nightlife for those seeking it. There is a modern part that boasts numerous shops, banks, schools, medical facilities and so on, most requirements for modern living in fact. Then there is the “Old Town”. To get into the old town one enters via stone archways through the ancient city walls. Once inside you enter a vast maze of narrow roads that are filled with many small shops, historical points of interest and some excellent restaurants that will tempt you with the aromas of Turkish Cypriot dishes or well prepared European cuisine if that is your preference. The town is home to the Eastern Mediterranean University which has something like 15,000 students and lecturers on the campus. This provides a potential pool of possible year round tenants for those interested in buying property with rental income in mind or as a full time letting business. The WOW factor of this property is the location being within easy reach of the city but just a few steps to the beach.